When your organization creates a document package, there are a lot of pieces that must fall into place perfectly. Documents such as HR packages for employees, student records, closing documents for real estate, and packages required for legal or accounting clients need to be complete, accurate, and delivered on time. Any type of process which requires documents to be collected, stay together, and in certain cases, stop or start a workflow, is a prime candidate for PackageWorks. DocStar ECM PackageWorks delivers streamlined, intelligent package-based workflows designed to dramatically increase productivity and ensure that document packages are consistent and complete. 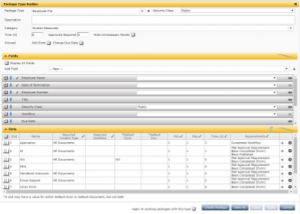 It allows you to define collections of document types and indicate whether they are required or optional. In addition, setting document and package-level due dates helps enable timely and thorough completion of workflows that require collections of documents. After all required documents have been gathered and the package workflow is complete, distributing these packages or subsets of these packages is easy with the built-in submissions capability. Once you define the package submission type, DocStar PackageWorks will collect the designated documents in the requested order and create a submission package to be e-mailed to a recipient. Integration with DocStar ECM Forms and DocStar ECM Workflow further enhances the solution by electronically capturing documents at the beginning of the process and applying individual document workflow routing and approvals as needed, while still enforcing package-level requirements. DocStar PackageWorks allows your important business documents to be routed electronically, enabling users to process work more efficiently, faster, and more accurately. 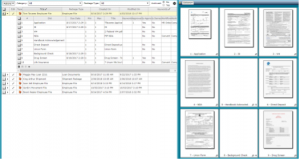 DocStar PackageWorks builds a document checklist designed to gather and track a set of documents necessary to complete a business workflow. Automate time-consuming and error-prone manual processes to increase productivity and operational efficiency, delivering a significant increase in workplace productivity. With PackageWorks, you will know how processes are performing. Managers can identify any lags and workflow bottlenecks that occur to redistribute workloads to other users before problems escalate. You can better manage the routine work processes with DocStar PackageWorks to achieve a competitive edge. Regulatory mandates and reporting requirements from Sarbanes-Oxley, HIPAA, and others have strict rules on how companies process, track, disclose, and distribute information. DocStar ECM with DocStar PackageWorks helps to enforce accountability and support compliance by standardizing and tracking business processes. You will know who completed tasks, when, and where. Each slot is expanded from the Packages tab or from within a search. See which slots have documents, set due date reminders, enforce an approval of any one of the slots, require a slot be a certain content type or insert a data entry form as part of the process. Configure a “Package” with a defined set of slots (aka Document Type), each with a specific approval requirement, whether the slot is complete based on other slots and having the visibility to see whats missing.